BWF-ZZ system, Geminate region. On the 15th of January at 17:17 EVE Stadnard Time, another battle was fought in the system between Drone Regions Federation (DRF) and low security space entities. The continued incursion of Project.Mayhem. [16-13] into the Geminate region saw the group and its allies clash with DRF forces, this time over an Astrahus citadel over the Oijanen gate in the system. The citadel had been previously reinforced by Project.Mayhem.’s allies, WAFFLES. [N0MAD] and was exiting its last invulnerability cycle. 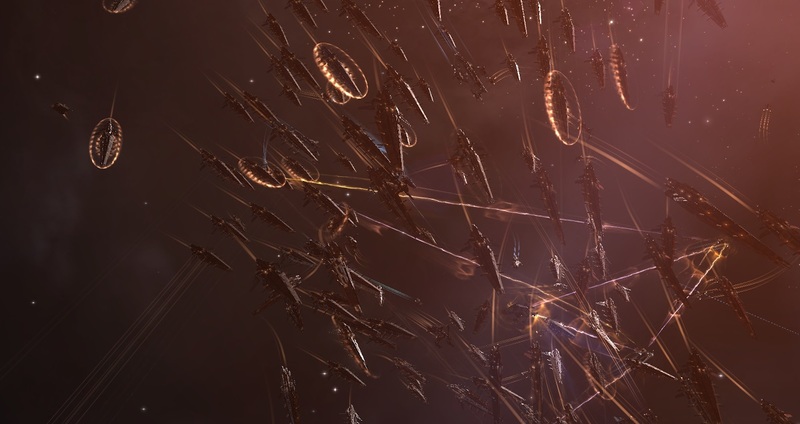 In order to save the citadel, DRF forces assembled a full (256 pilot) Hurricane battlecruiser fleet. The force set up on the Oijanen gate in the system, the hostiles’ only route into the system and waited for the attackers to come in. Project.Mayhem. did oblige, forming with Snuffed Out [B B C] a 120 pilot Tengu strategic cruiser fleet with Minokawa force auxiliary as support. Further reinforcements would later come in the form of a WAFFLES. [N0MAD] Nightmare battleship fleet numbering 50 pilots. The joint Tengu fleet jumped into BWF-ZZ, anchoring up and firing on the Hurricanes, which promptly retaliated, starting the fight. The amount of sheer firepower on the field was immense. Artillery cannons and railguns exchanged fire at point blank range, their munitions crashing against the robust shields of the opposition. The damage proved overwhelming, both sides trading mainline ships from the start. Battlecruiser after battlecruiser was shredded by the railgun fire while strategic cruisers were torn apart in artillery barrages. Quickly, the focus of the DRF fleet changed to the support wing of the Tengu fleet. Huginn combat recon cruisers came under heavy fire, most of them destroyed in the torrent of shells. As the battle gathered pace, the WAFFLES. fleet entered the system. The Nightmares quickly burnt away from the gate where the two sides were embroiled in a fierce battle, aiming to remain at long distance and snipe from there. However, with the Nightmares on field, the DRF fleet changed its focus, warping to a ping above the gate before warping back down on top of the Nightmare fleet, which burnt away. The Tengu fleet gave chase, perching as well before warping down on top of the Hurricane fleet. Each time, the fleets exchanged a flurry of blows before disengaging and giving chase once more. The Nightmare fleet itself also became the target of DRF stealth bomber squadrons, which kept landing bombing runs on it. As the fight devolved into a hit and run skirmish, the Tengu fleet more or less stabilized, inflicting damage on the Hurricane fleet which in turn focused its fire on the Nightmare fleet. After a few minutes of chase, and having suffered heavy losses, the DRF fleet disengaged first and warped to a citadel in the system to collect reinforcements and repair. The allies took advantage of the fact and decided to extract, warping back to the Oijanen gate and jumping out. However, the DRF was not done fighting yet. The fleet warped to the Oijanen gate in pursuit of the allied fleets. While missing the two fleets, who promptly warped off, the Hurricane fleet managed to snag the Minokawa force auxiliary, keeping it tackled on the other side of the gate and forcing the allies to rescue it. The Tengu fleet quickly returned, followed by the Nightmare fleet and the two sides resumed their fight. Losses mounted again for both fleets, the DRF focusing their firepower on thinning the logistics wing of the Tengu fleet, while the strategic cruisers kept volleying battlecruisers. The Scimitar logistics cruisers, under the heavy artillery fire, could do little to resist. One after the other, the fragile cruisers exploded, reducing the effectiveness of the logistics wing. After a while, the battle once again became a game of cat and mouse, as the Hurricane fleet kept re-positioning on grid to get in range of the Tengu fleet’s logistics wing. The strategic cruisers kept burning away and increase the distance between the two fleets, all the while the two sides exchanging fire. Finally, the DRF force disengaged, electing to warp to a Project.Mayhem. tower and reinforce it instead. With the allied fleets battered but still relatively intact, the decision was made to stand down rather than continue the pointless chase, leading to the two fleets warping out to the Akora gate. The DRF fleet, seeing this, gave chase once more and warped to the gate, only to catch a few stragglers as the main force managed to jump out and warp off. All the while, the citadel had exited its reinforced mode, repaired itself and resumed its scheduled invulnerability cycle unhindered, thus securing the strategic objective for the DRF. With no more targets, the DRF proceeded to reinforce a couple of Project.Mayhem. towers in Oijanen before returning back to its staging system, bringing the fight to a close. Battle report for the BWF-ZZ and Oijanen systems can be found here. Project.Mayhem. and allies lost 77 ships in the fight, including 5 battleships and 5 strategic cruisers for a total of 21.69 billion ISK damage. DRF lost 272 ships in the fight, including 191 battlecruisers for a total of 22.62 billion ISK damage. If you would like to take much from this article then you have to apply these strategies to your won web site. web site and now this time I am browsing this website and reading very informative content at this time. I am truly pleased to read this blog posts which includes lots of useful facts, thanks for providing such information.